Year of the Rabbit is a rock band assembled and fronted by Ken Andrews, formerly of Failure and ON. After the commercial disappointment of ON, Andrews and ON's touring drummer Tim Dow (formerly of Shiner and Season to Risk) first recruited Dow's friend Jeff Garber (lead guitar/background vocals, formerly of National Skyline and Castor), and Solomon Snyder (bass/background vocals, formerly of Cupcakes and Dovetail Joint) came onboard shortly thereafter. Whereas ON's material had been created mostly by Andrews as a solo project, the harder-rocking sound of Year of the Rabbit is much closer to that of his previous band, Failure. 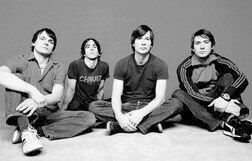 Their first release, the 2003 EP Hunted, was made available only from CD Baby, the iTunes Store, and the band themselves. It was enough to attract the attention of Elektra Records, who released their self-titled album the following July. Unfortunately for the band, however, Elektra's parent company, Warner Music Group, was sold in February 2004 to a group of private investors, who decided to fold Elektra into Atlantic Records, and many of the labels' underperforming acts, including Year of the Rabbit, were dropped from their rosters. Two months later, Andrews declared on his official website that due to the shakeup at their label, the band had been put on indefinite hiatus. Currently, Andrews is working both as a solo artist and as a member of Los Angeles Digital Noise Academy, as well as being a sought-after producer and session musician.